Over a year ago we toured the departure hub for all manned U.S. space flight. I have to admit, I found our visit to the Kennedy Space Center depressing. It reminded me how little our space program had achieved since the Apollo mission ended. Over the succeeding four decades we went from walking on the moon to, well, nothing. It can be said that our original manned space program was born on May 25, 1961, when JFK announced to a joint session of Congress his intention to land a man on the moon. It’s fitting then that exactly 51 years later, on May 25, 2012, the U.S. space program was reborn. Not by NASA, but by a private company only ten years old. For me, this Friday’s docking of Space Exploration Technologies’ (SpaceX) Dragon craft with the International Space Station represents the most exciting thing to happen since at least the first shuttle flight – and perhaps before. It’s exciting not because of the technical accomplishment. Docking with the space station isn’t new. It is exciting because of how it was done. 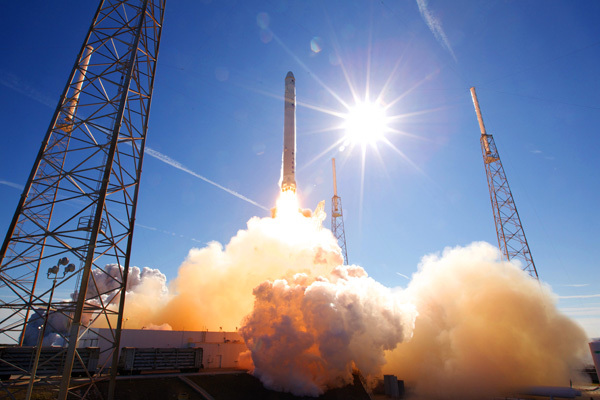 SpaceX is the first private company to ever deliver cargo to the orbital station. Only four governments have accomplished that feat. But shipping goods isn’t the company’s end goal. Its reusable Dragon capsule is eventually intended to ferry people too. That crew may get to ride Dragon as early as 2014. What we just witnessed is the dawn of commercial spacefaring. And like the commercialization of seafaring and aviation before, leisure craft eventually follow. We never had a shot at blasting off on a government owned space shuttle. But with private companies at the helm, it is only a matter of time. Whether on Richard Branson’s sub-orbital Virgin Galactic or on a Dragon “X” orbital craft, I now firmly believe that EverywhereOnce will one day blog from space. Wouldn’t that be absolutely amazing! We better start saving for the ticket. Put me down for the return flight. Ha! Sure wouldn’t want a one-way ticket on that trip.